As every home decorating enthusiast is well aware, color has an enormous impact within a space. With the increasing number of new and remodeled homes reflecting open floor plans, carefully considered color schemes symbolize an integral part of the ambience within the home. Without investing a small fortune for upgraded design elements and furnishings, color can be manipulated as the powerful ingredient that may be used to create a fashionably cohesive open styled home interior. The carefully considered repetition of color represents a simple way to unite open concept spaces. Repeating the same hue throughout an open space is a common way to cohesively join connecting areas. For example, implementing same color molding throughout an open space can successfully tie together adjacent areas that boast different floor or wall coverings. The use of identical trim colors on built-ins, (such as shelving units or book cases) stylishly integrates adjoining areas that are used for distinctively different purposes. Although ?color? still remains strong for 2003, experts are forecasting that ?white? will make a major comeback this year. Returning with fresh diversity, this ?non-color? represents an abundant array of practical and neutral selections for repetitive moldings and trims. Remember: white is not ?just? white! Prior to selecting the ?white? tone to be used within the open concept space, carefully consider the tremendous selection of available whites to verify that the tone you have selected harmoniously blends with existing surface coverings. Another method of effectively blending open spaces is by incorporating a limited palette of color that represents the same intensity of hues. Select the same tones consisting of two or three favorite colors that you would not easily tire of, and fashion two side by side spaces with the desired color palette. 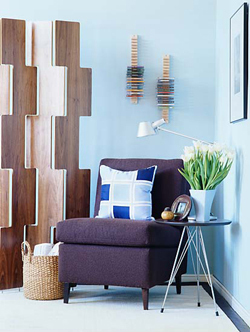 Utilize the desired color palette in varying amounts within each area. By limiting the color palette to a smaller number of colors that share the same intensity, the entire space maintains cohesiveness. Consider implementing any of these color concepts to help beautify and unify your open floor plan. The application of any of these tips can yield a custom touch that is often apparent within upscale homes that have been fashioned by designers that command high price tags. Applying paint to various interior surfaces is a budget-friendly way to blend open space living areas together. A savy do-it- yourselfer can produce attractive results that rival those belonging to the professional designer with an active imagination, a healthy dose of paint and color!